Children’s Hospital has begun construction on the new parking garage on its newly acquired State Street campus, launching the first phase of what will eventually be a dramatic transformation of the institution’s profile on Henry Clay Avenue, officials told neighbors Wednesday night. After Children’s Hospital acquired the former New Orleans Adolescent Hospital from the state, it agreed to preserve most of the buildings on the site, demolishing on a few decrepit former residential buildings along Henry Clay Avenue to make room for a new parking garage with room for up to 600 vehicles, Chief Operating Officer Justin Olsen said at a neighborhood meeting Wednesday. That site has now been cleared, and construction has formally begun on the garage , which will be free for anyone to use when complete some time in mid-2018, Olsen said. 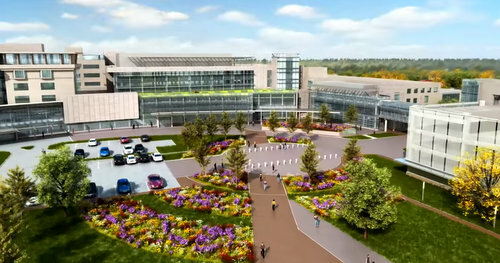 Once construction of the garage and the skybridge connecting it to the main campus is complete, a second phase calls for the construction of a new tower atop the interior of the existing hospital’s footprint. A third and final phase, expected to take until 2020, will demolish part of the Henry Clay exterior of the current building and create a new, modern facade. Olsen showed neighbors a video rendering of the final concept for the hospital, mostly from the perspective of someone approaching from Tchoupitoulas and turning down Henry Clay, with a final aerial view. The renovations are not intended to expand the hospital’s services, Olsen said; the only unit that will receive a significant expansion is the Cardiac Intensive Care Unit, from 20 beds to 28. Instead, the plan will rearrange the hospital to better fit the services it currently offers, he said. Another goal of the renovation is to streamline patient access onto Henry Clay, Olsen said. All of the outpatient and emergency entrances open to the public will be on Henry Clay, and the other sides of the building will be restricted to use by staff members only, he said. That new front entrance on Henry Clay will also feature a large family garden, Olsen said. Meanwhile, the hospital expects to receive word “any day” on its application for historic tax credits for the renovation and preservation of the remaining historic buildings on the former NOAH site, which Children’s Hospital officials now refer to as the “State Street campus.” In fact, Olsen said, the hospital has decided to preserve even more of the original campus than originally planned, keeping a caretaker’s cottage in its prominent location on the corner rather than moving it to the rear of the site as previously considered. “We’re going to be taking it back to its grandest days,” Olsen said of the caretaker’s cottage. About a dozen nearby neighbors attended the meeting. Most of their questions were clarifying questions about the configuration of various buildings or operational details, and no one spoke in opposition to the project.